The legendary survival-horror series has returned once more, this time on the Xbox 360 and Playstation 3, but will RE5 be able to live up to it's prestigious name and the massive amount of hype surrounding it? Is It All Worth Fighting For: Resident Evil 5 takes place in Africa in the year 2009. After word of another strain of virus spreading throughout the country is discovered, the BSAA send Chris Redfield on a mission to discern what exactly is going on. When Chris arrives at his destination, he is teamed up with another BSAA agent, Sheva Alomar; a native to Africa and a woman with a tragic past that has ties to the Umbrella Corporation. While in Africa, Chris and his partner Sheva discover something far worse then anything they have ever seen or could ever imagine. The storyline of RE5 is very impressive and is very engrossing throughout the long length of the campaign. It is very easy to follow and will keep you hooked until the end. You will also encounter a variety of plot twists and surprising things that will keep you waiting for the next cutscene. Welcome To Africa: Resident Evil 5 showcases gameplay that is quite similar to that which you may have enjoyed in Resident Evil 4. While on foot you will play through the game using an over-the-shoulder view that deeply immerses you, especially when you have a mob of zombies in your face. As you progress through the campaign you will be taken to a wide variety of locations such as train stations, mining shafts, swamps warehouses and many more. Gameplay wise, you won't see much here that you haven't already experienced in Resident Evil 4, which has it's strong points, but also has a couple of flaws. You are only able to shoot your weapon or attack with your knife if you first stop, ready it and fire. You are forced to stop if you want to attack, and you cannot take a single step without lowering your weapon first. Also, there is no option to simply fire from the hip. You are always forced to aim down the sights, thus bringing you to a complete stop. While this doesn't necessarily damage the gameplay, in fact, it makes gunplay more intense, it can be a tad bit frustrating when you have zombies trying to maul you to death and is especially inconvenient in close spaces. The gameplay overall though is very intense and very enjoyable. There is no way you cannot help but smile when you aim down the sights on your pistol and blow an enemy's head off from 20 feet away. Save Me, Save Me: For the first time in the long-running and easily recognizable franchise, the latest installment of Resident Evil 5 features a full cooperative (co-op) system that allows you to play through the entire campaign online, or with a buddy sitting next to you. Player 1 controls Chris Redfield, while Player 2 will control Sheva Alomar throughout the campaign. Both characters are essentially the same, but each has their own personality, which does add something to the co-op. If you are completely friend-less, you still have the option to play through the game with the AI controlling Sheva, though it isn't recommended. The Artificial Intelligence controlling Sheva can and will do more harm then help. The AI will get in your way, run far ahead of you or stay far behind you as well as occasionally mishandling an enemy (i.e. running in circles while a massive zombie with an axe attacks her). Throughout the game there will be several opportunities to use your partner's strengths to their fullest. From boosting Sheva up to an otherwise unreachable height, to holding a door open while you partner runs under it, there are many chances to cooperate during the game. In addition to those co-op specific maneuvers, both characters can help each other out in a variety of ways. You can heal your wounded partner, split up in certain situations or even save your partner from being eaten by one of the infected. The co-op in RE5 works tremendously well and substantially boosts the enjoyment you will get out the game. African Sunshine: Resident Evil 5 takes a welcome change from the dark and dreary surroundings you most commonly face in favor of sunshine and rainbows...ok, maybe not rainbows but the sunshine is still there! You will rarely ever be thrown into a situation where you are forced to fend for yourself in the darkness. Most of the time you will be able to see everything around you in plain daylight! The visuals showcased in RE5 are very impressive and are immensely realistic in everyway. From the enemies you face to your environments to the cast of characters you will encounter, RE5 is a highly polished game that pleases the eyes. 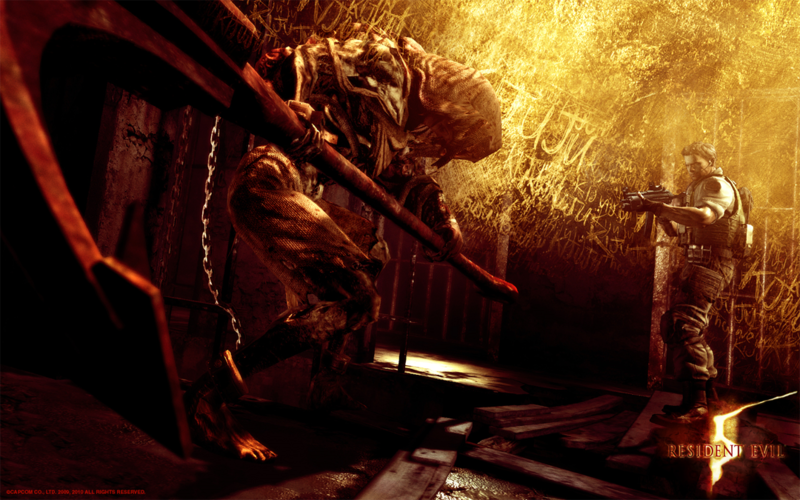 You Have To Speak Up: In addition to the graphics in RE5, the audio featured in the game is also very notable, though there is one slight quibble. The voice acting in RE5 is spectacular as are the various sounds and effects you will be able to enjoy such as a groaning zombie or the sound of a shotgun. You will not be disappointed with the audio in the game in the least bit. Though there is one issue in how loud the cutscenes are. At times during the cutscenes it can be a little difficult to hear what is being said, though this minor problem is solved with easily readable subtitles. Rent vs. Buy: Resident Evil 5 is a tremendous game that does not suffer from any major flaws whatsoever. The game is absolutely brilliant in it's design, gameplay, visuals and audio as well as storyline. This title is a must buy for anyone who is a fan of the series, but also anyone who enjoys shooters in the least bit. There is no excuse to miss this astounding game that easily lives up to the hype that has surrounded it since it was announced.